47¾" (121.5 cm) bust circumference with fronts overlapping and 26¾" (68 cm) long at center back. Satisfyingly simple and straightforward, this project is an ideal opportunity to experience knitting with the exceptional pure wool Plötulopi. 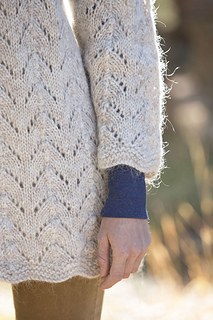 This ethereal Icelandic yarn is both sumptuously warm and wonderfully fuzzy—think of arctic hares and foxes and you can begin to imagine what it is like to wear the Fia cardigan. 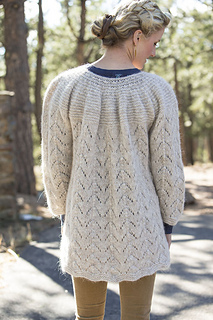 The yoke is given a slight gathered effect reminiscent of traditional peasant blouses, and the simple lace stitch and garter-stitch border are both stitches commonly found in traditional Nordic and Icelandic knitwear, and mittens in particular. Some care must be taken when working with this yarn (which is used double throughout), as it is surprisingly fragile. 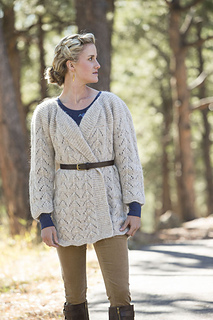 If you are using it for the first time, I would recommend that you knit a practice swatch before embarking on the whole cardigan. It is also essential that once the garment is completed it is carefully washed in warm soapy water and blocked. 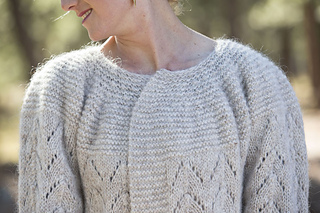 Then, and only then, will the full beauty of the Plötulopi yarn be revealed. Size U.S. 10 (6 mm) 32” (80 cm) circular (cir) and set of 5 double-pointed (dpn). Adjust needle size if necessary to obtain the correct gauge. Markers (m); holders; tapestry needle.